Your home’s bathroom gets more use than just about any other room in the house. So, it’s no surprise that it’s also one of the most common places homeowner’s choose to focus their remodeling efforts. And, since the shower is such a central part of our daily routines, it’s natural to want one that offers more than just utility but also beauty and functionality. When thinking about a shower remodeling project, one of the first things to consider is the style of shower you’d like to install. There are two main types: Showers with frames and those without. 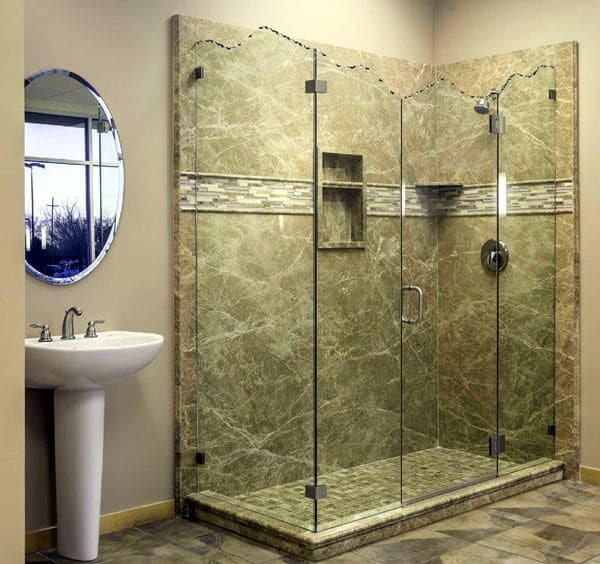 If you’ve never owned a frameless shower, there are many reasons why you may wish to have one. But are they superior to standard framed showers? And what are the drawbacks, if any? This will be one of the first considerations you’ll have because there can be a significant price difference between framed and frameless showers. For each type there can be a wide range of prices based on the size of the enclosure, the height of the door and the type of glass being used. Also, there may be custom installation required depending on the space available. That being said, on average you can expect to pay more for a frameless configuration – sometimes a lot more. But for many homeowners, the extra investment is well worth it because the end result is so aesthetically pleasing. Most shower enclosures and doors can generally use the same types of tempered glass but the main difference is in the thickness of the glass. Typically, framed showers will use a use a thinner glass because of the weight and the frame is what’s supporting the door. The metals commonly used will be aluminum or brass that comes in different shades, colors and finishes. Typically, framed shower enclosures will always be less time and labor intensive than frameless because the frame is fitted for the glass. Once the frame has been installed it’s just a matter of securing the glass inside the tracks. Also, since the glass is lighter than with frameless doors this makes things easier. With frameless doors, not only is the glass heavier but there is nothing to secure the glass other than specially made clips which are attached to the walls. Usually holes will have to be drilled in order to secure the clips and must be done with care so as not to damage the surface materials or tiles. While some framed shower doors can be done by handy “do-it-yourselfers”, this works best when stock items are available that are an exact fit for your enclosure area. In most cases, it’s best to hire a professional who can measure and make sure that the glass or frame are the perfect dimensions for what your project requires. Frameless doors should always be installed by an experienced professional. One of the biggest benefits of frameless shower doors is that the water runs right off them, so there’s no buildup of mildew or mold. This makes cleaning a bit easier and usually results in a longer lifespan than the framed shower. And, if you add Diamon-Fusion protection to your glass, which is a protective coating, you can reduce your cleaning by up to 90%. Framed doors, on the other hand, can corrode over time because water will collect in the channels and lead to buildup of deposits, minerals, dirt and even mold. As with frameless doors, a good protective coating is highly recommended. Shower door glass for both framed and frameless is tempered, which means that if for any reason your door were to fall off or break, the glass would come apart in small rounded pieces to reduce the risk of injury. While this is an uncommon occurrence, it is important to take precautions if your doors ever become loose, unhinged or cracked. 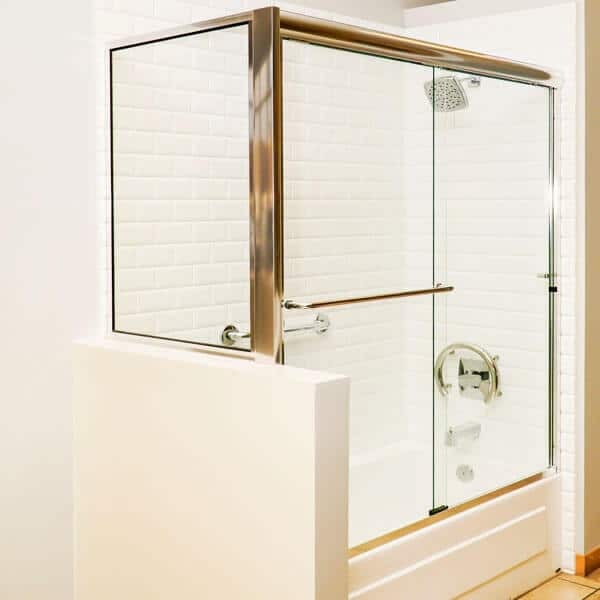 So, when you’re ready to make your decision on whether to go framed or frameless, a good place to start is with a shower door company that specializes in both types of installations. Make sure they can also do custom installations and offer a wide variety of designs to match your decor. Most reputable dealers will offer free in-home estimates to measure your shower area and provide a written quote. Schicker Luxury Shower Doors, in Concord, serves the entire Bay Area and offers a huge variety of styles and designs, both custom and brand-name. Contact Schicker for a free in-home or in-showroom estimate today!